In its presentation at GDC today, Google touted its partnership with AMD, which created the unnamed card for integration with its Stadia “instances,” the Linux-based computers that will actually run the games players stream. 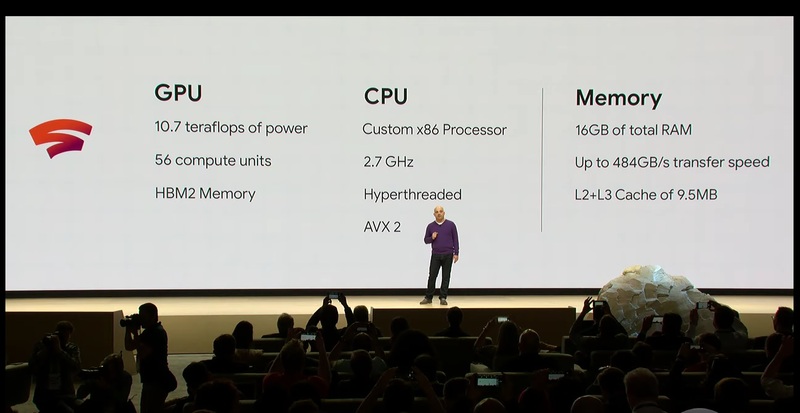 The actual specs shown on screen don’t mean much to hardware fiends — teraflops are how supercomputers are rated, not graphics cards, which have sophisticated custom units and pathways for different effects and calculations. So although it’s impressive that this one produces 10.7 TF, more than the PS4 Pro and Xbox One X combined, unless you’re using this hardware for sequential logic operations, it’s more important to know its actual game-specific chops. Of course, I’m sure the GPU is also quite competent there — it has to handle both running a modern game at 4K and 60 FPS and may have some extra load from streaming the video as well. The 16 GB of “total” RAM is also suspicious. The way it’s phrased suggests it may be inclusive of video RAM, i.e. that in the graphics card, which makes the most likely combo 4 GB in the card and 12 for the system. That’s just speculation, though. Interestingly, shortly after announcing the single-GPU system that the Stadia will use, a multi-GPU instance was teased in order to show the possibilities of fluid dynamics in games. It’s unclear how this would come into play — perhaps it’s necessary for 4K instances of some games, or would be an upsell for performance-obsessed players. Whatever the specifics, this gives an idea of what kind of power and cost the Stadia backend infrastructure is going to necessitate. Every concurrent player will require a dedicated instance, which at the scales Google hopes for means at least a couple hundred thousand of these things, increasing to millions if it takes off. Call the bill of materials $150 plus $50 a year in maintenance and upgrades (this is all just napkin math) and you’re easily looking at a hundred million dollar bottom line, probably way more. As of this writing (the presentation is ongoing) there’s still no mention of how Google plans to make money from this whole… situation. Show ads every 10 minutes of play? Take a cut of game sales? Publishers pay Google to make instant games available? Perhaps, as with plenty of other Google products, they’ll just release it first and figure out how to make money later. That works sometimes.